Now that Samsung has finally unveiled the new Galaxy 5 and Galaxy S6 + edge, we were hoping to break from the news and rumors related to the two devices, but it is not over yet. The Galaxy 5 is not going to the European market this year. Shock and disbelief, they would say. Last night was subsequently reported that although the Galaxy 5 in the US market in sales by the end of this month, Europeans will be a long wait. 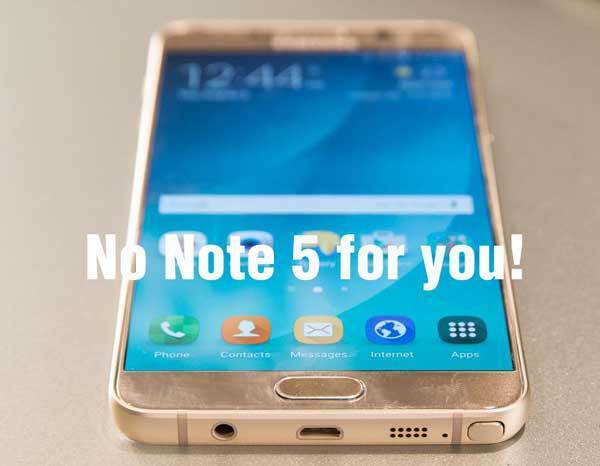 For unknown reasons, except for some tactical, Samsung in Europe does not intend to offer the Galaxy Note 5 to the end of this year. In Europe will soon get his brother Galaxy S6 + edge, but not the Galaxy Note5. Although these are two very similar devices, at least in terms of specifications, I believe that this news will irritate many of you, because S6 + edge sounds and looks very nice but doesn't have the famous S Pen as Note5. Although not explicitly confirmed, the Galaxy will probably in this area still occur, but if this happens there will be before the start of 2016. What Samsung is trying to achieve with this move now is not clear.